Air India Air Transport Services Limited, Is Holding A Walk-in Interview For The Various Post For Ground Duties At The Airport / Station At Eastern Region On Fixed Contract Basis For The Period Of Three Years. So Eligible Candidates Can Apply For This Job. Please Do Check Out The Official Advertisement/Notification For Accurate Information, It's Given Down Below. Various Posts → 250 Vacancies. 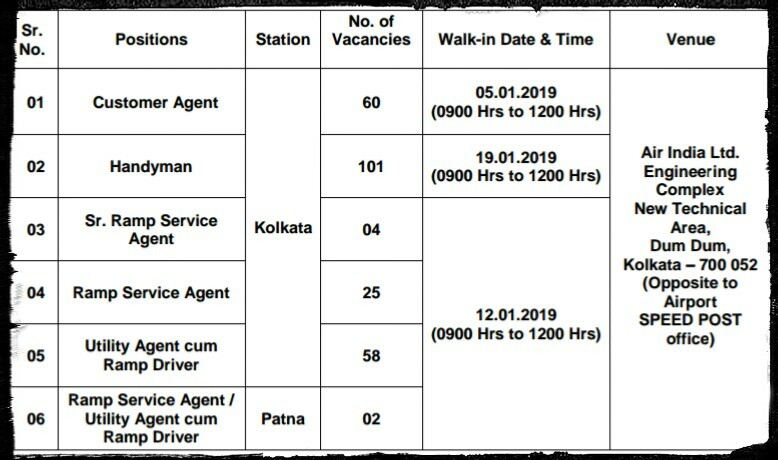 Total Number Of Vacancies →250 Various Posts. B. Eligible Criteria For Air India Air Transport Services Limited Recruitment 2018 -19. Age Limit →General: 28 Years (Born Between 02.12.1990 And 01.12.2000) OBC: 31 Years (Born Between 02.12.1987 And 01.12.2000) SC/ST: 33 Years (Born Between 02.12.1985 And 01.12.2000). Educational Qualifications →There Are Different Requirement For Each Post, So Kindly Check Out Tihe Notification Below. Mode Of Examination/Selection Process →Personal Interview, So You Are Requested To Carry All Your Original Documents. Offline Application/Examination Fee →₹500 Only For General/OBC Candidates Through Demand Draft In Favour Of “AIR INDIA AIR TRANSPORT SERVICES LTD.”, Payable At Mumbai. Date For Walk-in Interview →Please Do Check The Image Above, For Both Date & Venue. Result →Check Out The Information Related To The AIATSL Results On Their Official Website Here>The Official Website For AIATSL. Now Apply For AIATSL Recruitment 2018 -19 Application Form, Below. Notification/Application Form (Click Here To Download) . Thank You For Your Support & Keep Visiting Here For Latest Government Jobs News Alerts, Till Then Stay Safe And Blessed.